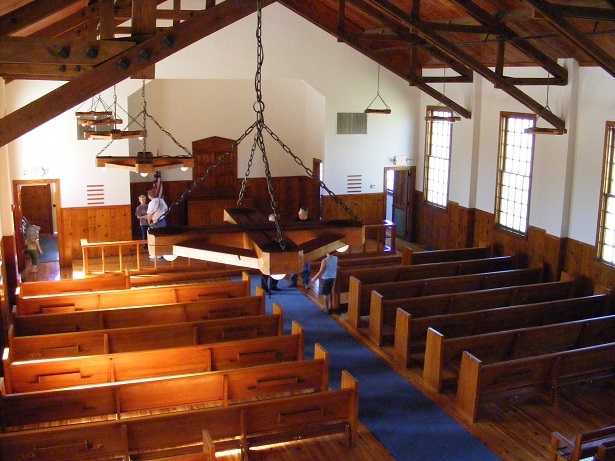 Most of the drama in this story takes place in a Contonment US Army Chapel like the one in the photo above. These chapels were build on nearly all US Army forts and bases during World War II, though I have seen some claimed to date from WW I. The chapel I served duty in during my stay at Fort Knox looked exactly like the one above. The offices were in the rear and front corners, one pair of offices for the Catholic Chaplain and his assistant, and one pair of offices for the Protestant Chaplain and his assistant. The back entrance came in the left rear corner, and that was where my office was. The Chaplain I worked with was Captain Gilbert Bender who was Assembly of God. He had an intense zeal to win souls, and he did genuine follow-up for every confession of faith. In the beginning of the work day, if I had to interrupt Chaplain Bender for a phone call or visitor, I would find him on his knees on the steps going up to the altar praying, and often with tears. He prayed daily for souls, and he prayed for every soldier who confessed faith during any of our meetings. Colonel Monsignor Chaplain Emil Kapusta was the new Post Chaplain at Fort Knox. Chaplain Bender, the Chaplain I worked for as a Chaplain's Assistant, was not very impressed with the previous Chaplain's Command Office. They did very little to enhance the ministry of a real man of God, that is, a Chaplain at Fort Knox. Oh, the Post Chaplain was a good soldier by Army standards, but he went away to another post, and along came the Monsignor from Yonkers, New York. Col. Kapusta had joined the Army during the Korean war in 1948, and he was awarded the Silver Star for gallantry in Korea. He was commended for going to soldiers under fire who were troubled, and he is said to have never missed ministering the Last Rites to a dying soldier, even under heavy combat. The photo shows Col. Kapusta (right) chatting with Cardinal Spellman during a visit to Korea. Col. Kapusta was the last Chaplain to leave Vietnam as the US Army fled that nation in defeat. While Colonel Kapusta did not believe what I believed from the Word of God, he had honestly earned some serious regard from the Army Command. So, that is the side of the Colonel that speaks well for him. The US Army has a very efficient grape vine, and any officer on the move to a new assignment will find that most of the men in his new command will already have heard a lot about him, for good or for bad, before he arrives. This was very true of Col. Kapusta. We heard that he was a man obsessed with perfection, and the word was that he was extremely eager to be promoted to General and Chief of Chaplains of the US Army. This meant we were in for some trouble from this man. To explain my role in this story, I need to explain how the Army command works. Permanent Party soldiers are men assigned to duty in some company where they bunk and eat in the mess hall. This is their home company. Each soldier is also assigned to duty in some area of a fort or base. This may be as a clerk or functionary to keep the monster of busy work moving along without hitches. Thus, each soldier has a Company Commander over him where he billets, and he has a duty Commander over him where he works. Col. Kapusta was the Commander of the Fort Knox Chaplain's staff officers, and my destiny was in his hands. We knew Col. Kapusta would distinguish himself in some way, and for us this was a fearful moment. It was a very cold winter in Kentucky, and we had a lot of snow. The Colonel's first order was that we must have the "stoop swept" of snow by 7:30 every morning. That at once made us Chaplain's Assistants a longer work day. Way to win friends, Colonel. Staff officer's offices were all opened at 8:00 every morning, so we learned quickly that Colonel Kapusta was going to flog us with plenty of new rules, even lengthening our work day. In the US Military, there are no rights regarding work and assignments. You are given orders, and you do them or pay a price. Colonel Kapusta also demanded that our phone be covered at all times. But, we had duties in which I had to drive the Chaplain to some graduation parade, or the Chaplain might decide to visit the rifle range to chat with officers and trainees. It was impossible to have our phone covered all the time. So, I made a phone cover out of cardboard so that we could claim our phone was always covered. Chaplain Bender loved it. The Colonel declared that he would do Catholic Mass in a different chapel on Fort Knox every Sunday. He also went to the bivouac areas on Fort Knox where Tank Training was in progress, and he did Mass on these ranges from time to time. His first Sunday at Fort Knox he chose our chapel to do the Mass. What a panic. I had to clean and tidy up for this event as if we were having an IG inspection. But, what actually happened changed Colonel Kapusta's zeal to look for dust on a file cabinet or a dry holy water receptacle. On the Sunday in question, Chaplain Kapusta arrived in his own personal car rather than a Military staff car. So, he had no driver to help him. The Catholic duty Chaplain's Assistant was away on pass, and a trainee from one of the companies had been recruited to come with a key early Sunday morning and open the back of the chapel, prepare for the Mass, and turn the heater on. This volunteer Catholic trainee was also to be the altar boy for the Mass that morning. The front doors were always open for anyone who wanted to pray, but all the inside doors needed to be unlocked. Everything should have gone well, for this plan had worked many times before. But, alas, the volunteer altar boy did not wake up early enough, and Chaplain Kapusta found the back door locked solid. He went to the front and into the chapel, but the inside doors to the offices in the rear were also locked. So, Chaplain Kapusta came around to the back again, and he found that he could jimmy the window to my office open. The reason I was not there was because I did not have to be there for the Catholic Mass. I came in later for the Protestant service. Chaplain Kapusta, to his credit, climbed through the window and opened the dead bolt on the back door. This allowed him to bring his vestments into the chapel for the Mass. We must stop here and explain the door arrangement to the rear of the chapel. The photo shows the two inside doors leading into the rear offices. Mine would be on the left. But, there were two more doors- one you can see is open and leads from the office on the right onto the altar area. This allows the Catholic priest to carry his paraphernalia for the Mass directly to the altar. There was another door leading from my office up to the altar area. All these inside doors were locked so that they could not be opened from either side without a key. This meant that Chaplain Kapusta could get to any part of the rear of the chapel, but he could not get through any door into the inside of the chapel. He tossed his cap and coat onto the file cabinet, and he put on his vestments while he was supposed to be praying in Latin to bless himself and his holy clothes and gloves. It may have been Latin, but I suspect it was not the official prayer version. I suspect he was breathing out fiamme dell'inferno. and brimstone on the head of the trainee who was still in his bunk back at the company barracks. He then poured the Christian Brothers wine into the chalice, loaded the pyx box with the hosts, and he let himself out the back door. When I arrived later, I saw the footprints in the four inches of show which lead from the back of the chapel through the yard to the front. This was a real puzzle to me of course. It was clear later that his robe would have dragged in the snow all the way, thus giving his ankles some discomfort as the wet robe swung about. Chaplain Kapusta then walked to the altar from the front entrance of the chapel, which is not at all proper. The priest is supposed to come onto the altar, high and lifted up, above the peasants in the pews. Chaplain Kapusta found only about ten trainees had showed up for Mass, and he no doubt tried to learn if one of them was to be his altar boy. No altar boy yet. Chaplain Kapusta then entered the chapel and found the place almost as cold inside as outside, and it was a midwinter day well below freezing outside. The heater had not been turned on. At this point, Chaplain Kaupsta did what any other US Army officer would have done. He did not bother to look around for the switch on the wall to turn on the heater overhead. He went to the altar, arranged the candles, lit them, and he then proceeded to be both priest and altar boy to himself. Enter yours truly, Specialist Steve Van Nattan. I lived off base with my wife in the town of Vinegrove. The drive was nasty due to the snow, but I was on time. I arrived at the back door and noted the personal car of Chaplain Kapusta. I found the back door open which should be normal if the volunteer alter boy had been there. I went inside, and it was freezing cold. I saw the Colonel's cap and coat, and I trembled. I at once sensed that something was very wrong. Someone had not turned up the heat. I went to the door to the inside of the chapel and quietly tried to turn the door knob. It was locked. I then realized what had happened, and I knew that there would be one very angry Monsignor on the other side of the door leading up onto the alter area. So, I very quietly unlocked the door into the chapel. I knew the trainees worshipping, and the Colonel, would be shivering in pain from the cold. I walked quickly to the heater switch, flipped it on, and I fled back into the office. The heater roared, but it would be quite a while before heat reached the altar because the one big heater hung square in the middle of the ceiling. Back in the office, I very quietly tried to unlock the door to the altar, but it went CLACK real loud, and I heard Chaplain Kapusta pause mid-sentence. He would probably think I was the late and dilatory Catholic trainee. Dread now seeped into my soul. There was nothing left to do, so I settled down and listened to the homily, which Chaplain Kapusts was roaring forth in his healthy Polish voice. He was soundly thrashing the ten trainees sitting before him because so few of them had come to Mass. Much proof from Canon Law was flowing forth to convince them that their Catholic friends back in the sack were lousy Catholics. I failed to see what spiritual benefit the ten trainees gained from the rage of the Chaplain. The trainees all came forward and got their sip of frosty wine and a very cold Jesus cookie. At this point, I braced myself. And, sure enough, the door from the altar burst open with a crash, and an avalanche of one raging Monsignor came down the steps glaring at me. "Are you the Catholic trainee who was supposed to be my altar boy?" "No sir, I am the Protestant Assistant for the next service sir." I fully expected to be thrashed by proxy for the trainee, but to the Colonel's credit, he only let out a great ecclesiastical snort, and rushed into the back area to change out of his vestments. He was supposed to deprogram himself in proper ministerial manner using various Latin prayers. But, what came forth was a very well delivered review on the unworthiness of the modern altar boy. The Colonel then gathered up his dignity, cap, and coat, and he rushed out the back door to his car. I offered him a cup of coffee which I was brewing, but somehow he had lost his zeal for social exchanges. I watched him leave, and after his car was well on its way back to his warm apartment, I sat down and roared with laughter. And, that was not the last Colonel Kapusta would see of me, nor would I be so lucky as to avoid his wrath and ministry of rage. Chaplain Colonel Kapusta was a "strac" soldier. I never learned what the root of that word is, but it means a well turned out soldier observing every detail of military codes and protocols. The Colonel demanded this of everyone. One way he proved his zeal, to do it the Army way, was that he insisted on occasionally going to the back side of Fort Knox to do the Mass early Sunday morning for the troops training in tanks. These poor soldiers were getting to sleep in for just one morning on Sunday, and it was well below freezing when the Colonel decided our chapel would participate in his next gung ho venture. I had to check the Chaplain's jeep out of the motor pool, and I would have been delighted if it had not started. It was 5:00 AM, and the jeep started up and sounded eager. I turned on the heater, and it breathed out a bit of damp warm air. The jeep had canvas sides, so the heater mostly warmed Kentucky rather then us occupants. I parked at the chapel front door, and I waited for Colonel Kapusta and the Catholic Chaplain's Assistant to arrive. The Assistant we will call Hindly. He had been drafted into the Army out of an antiwar coffee house, and rather than flee to Canada, Hindly submitted to the ultimate humiliation of a war protester and let himself be drafted. Hindly came walking down the road zig zagging from side to side due to the effects of last night's foray into Louisville to some protest bar. He was seriously medicated by the ministrations of Saint Budweiser. His uniform looked like he had slept in it for weeks, and his boots would have been rejected by any Goodwill Store. I got one whiff of Hindly's breath, and I told him to climb into the back of the jeep, pull his field jacket over his head, and try not to exhale in the direction of the Colonel who would be in the front seat. Chaplain Baine was the Protestant Chaplain who would do the field service for the Protestant soldiers, that is, if any rolled out for church at 15 F. I was Chaplain Baine's Assistant for this event. Chaplain Baine took one look and Hindly and got a knowing grin on his face. 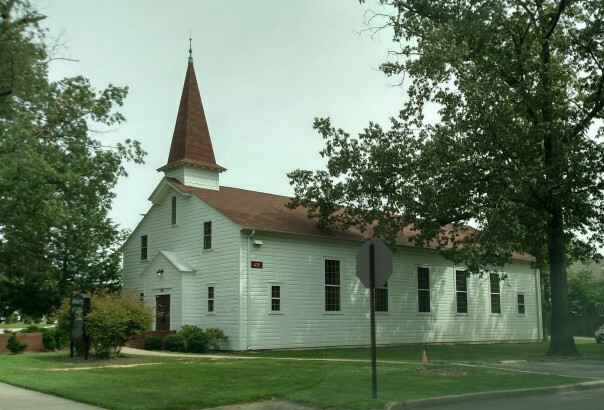 Being a Lutheran, Chaplain Baine made the foursome very much an ecumenical affair- a Monsignor, a Lutheran, a Baptist, and a drunk. The World Council of Churches would have been proud of us. We set off for the range. This meant I would have to drive across the whole of Fort Knox which was huge. The roads were covered with snow and were slick in places. I suggested to Chaplain Kapusta that we could go off the Military fort onto a civilian highway, drive east, turn north, and come out on the back side of the fort where a local farmer had given the Army permission for officers in smaller vehicles to cross his farm and get to the tank range. This would allow us to drive on plowed roads cleared of snow. "No, Specialist, we will stay on the Army roads. I see no need to drive on civilian roads." This was said with a touch of high ranking sarcasm, which I took to mean I was a bit of a wimp. Well, "Strac" is the word. I set off on the good old Army roads trying not to slide into the ditches. I came to a turn that would take us across a small river. I had barely turned when I saw in the fog an orange and white barricade. "Road Closed." We slid to a stop just inches short of the barrier, and the headlights shined into a yawning abyss where the bridge had once been. The Army Engineers were replacing the bridge. We all gasped, including Monsignor Kapusta. We sat there for about half a minute when Chaplain Kapusta said, "Specialist, why don't we go ahead and take the civilian route. I think that might be safer." The rest of the trip was uneventful, and we pulled into the bivouac area in the fog and the early dawn. It was cold, dark, and damp. The First Sergeant announced our arrival to anyone devout enough to roll out and stand in the damp air and make an effort at worship. I was pleasantly surprised at how many men came out. The Catholic soldiers stood around a metal folding table that served as an altar which Hindly arranged in fair fashion for the Mass. I set up the altar cloth and candles for the Protestant service on the hood of the jeep. The candles lit and promptly blew out in the breeze. I glanced over at the Catholic service, and they were hailing Mary through clenched teeth. Saying Hail Mary with your teeth rattling seems blasphemous. After the service, I felt that Hindly had done pretty well for being totally hung over. But, I had missed something. When we got back into the jeep, Chaplain Kapusta turned to Hindly and said bitterly, "Specialist, would you please not lean on the altar all the way through the Mass next time." The Colonel did not seem to see the humor in the moment, but Chaplain Baine and I certainly did. Of course, we waited to have a good laugh over it all until Monday morning, after I swept the snow off of the stoop.